We should all be grateful that the terrible butchery in Lebanon has stopped this week, after more than 1000 Lebanese and Israelis were killed. The US encouragement for its ally Israel to invade Lebanon has backfired on both governments. The embarrassing situation facing the most powerful army in the world in Iraq and the fact that the fourth most powerful army has been fought to a standstill by a couple of thousand Hizbollah militia in Lebanon must make even the ignorant among us realise that things aren't going according to plan. All that the US-backed Israeli attack on Lebanon has done is allow Hizbollah to become the new darling of the Muslim masses. The traditional political paradigm of left and right doesn't seem relevant to politics in the Middle East. Marxism always underestimated the power of religion and nationalism. I've tried to find out more about the new scary monster - the general secretary of Hizbollah, Sayyed Hasan Nasrallah. Without wishing to annoy his opponents, it's clear that he is the leader that people in the streets of the Middle East are looking to. 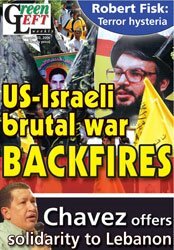 Nasrallah is a great fan of Hugo Chavez, the left-wing President of Venezuela. He calls on socialist and left movements to join him in the international struggle against injustice. Before the United Nations ceasefire this week Nasrallah was quoted by a Turkish newspaper as saying: "This fight is not only our fight. It is the common fight of all those oppressed across the world. "Don't forget that if the peoples of Palestine and Lebanon lose this war, this will mean the defeat of all the oppressed people of the world." In the interview he called on the traditional left to support his cause. "What we are saying to our socialist friends who want to fight together with us for fraternity and freedom [is] so long as we respect your beliefs, and you respect ours, there is no imperialist power we cannot defeat." This man is no Osama Bin Laden. He's much more clever. New Zeal Matt is of course a Marxist-Leninist and like the rest of his movement he is trying to build bridges with militant Islam. McCarten is closely allied to the Australian Marxist-Leninists of the Democratic Perspective. The DSP are very pro Chavez and extremely anti Israel. read their publication, Green Left Weekly if you doubt my word. McCarten's UNITE union has solicited funds from Venezuela. McCarten also works very closely with the NZ Socialist Workers crowd, through their "Workers Charter Movement". Socialist Woker's Australian counterpart the International Socialists, have formed a "Socialist Alliance" with the DSP, the Communist Party of Iraq (In Australia) and other groups. Socialist Workers British counterpart, the Socialist Workers Party, works with radical British Muslims in the "Respect" electoral coalition. "Respect" is also very anti Israel and pro Hezbollah. The Marxist/Muslim alliance is real and growing. Matt McCarten seems to approve.